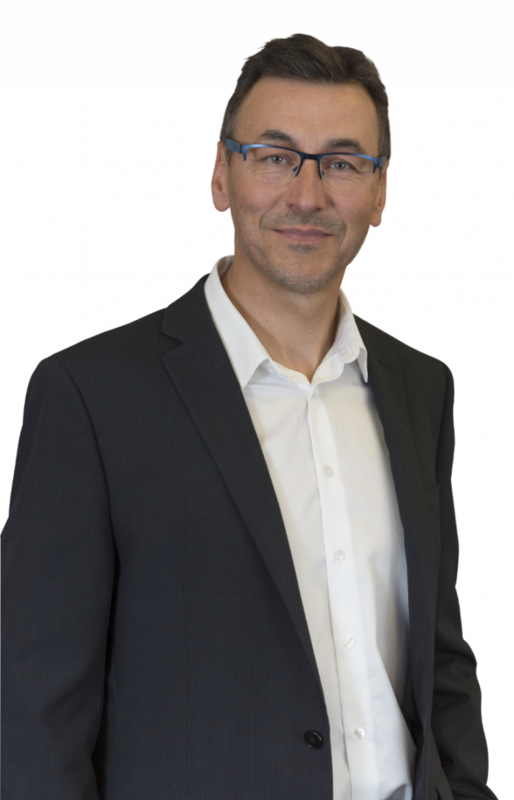 Dr. Jean-Luc Grisard is an orthopedic surgeon in Lyon specializing in foot and ankle surgery. Dr. Jean-Luc Grisard qualified in physical and sports education in 1986, before turning to medical studies, which he completed in 1992. He then specialized in orthopedic and traumatologic surgery, in the University of Liège. In 1996, he took a certificate in sports surgery in Paris. He set up in practice in Savoy in 1998 and undertook a specialization in foot and ankle surgery at Claude Bernard University, in Lyon, qualifying in 2002. At the same time, he went into joint practice with Dr. Jean-Jacques Legrand, in the Clinique Saint-Joseph in Chambéry. Here he was able to develop foot and ankle surgery, for which there were no specialists in Savoy or High Savoy, while Dr. Legrand focused on hip and knee surgery. In 2003, he took the chair of the Nosocomial Infection Committee (now known as the Infection Risk Prevention Committee), and he and his team at Saint-Joseph secured high ranking among French private-sector hospitals in the fight against infection. In November 2010, he joined the executive bureau of the French Foot Surgery association, as Secretary for Regulatory Affairs, under the presidency of his colleague and friend, Dr. Jean-Luc Besse, from the South Lyon University Hospital. Dr. Besse and he were actively involved in setting up the French Ankle Implant Registry, to keep an exhaustive record of all ankle prostheses implanted in France. In January 2010, he undertook a university certificate course as expert medical witness for bodily injury assessment, which he completed in September 2012, with a thesis on conflicts of interest in the medical world, and notably the history of how a defective ankle prosthesis got withdrawn from the French market in 2008. He is currently working in the Lyon Clinique du Parc, in association with Dr. Jean-Yves COILLARD and Dr. Daniel BOUBLIL. He deals with pathologies of the ankle (degenerative diseases such as osteoarthritis, but also sports pathologies), hindfoot (flat foot, etc.) and toes (hallux valgus, claw-toe, Morton’s neuroma, etc.). He is an active member of the AFCP and represents the association in Orthorisq, an organization involved in the accreditation of orthopedic surgeons in France, under the Health Authority (Haute Autorité de Santé). He is also a member of the European Foot and Ankle Society (EFAS) and the American AOFAS society, of which he is an active member, with a presentation made at the Congress in Long Beach, California, on the long-term results in his personal series of big-toe fusion. He is also an expert witness for the Appeals Court in Chambéry. 1981: School-leaving certificate (Latin and Math section) with honors, Athénée Royal de Liège 1, Liège, Belgium. 1986: Bachelor’s in physical and sports education, Liège University, Sart-Tilman. Le clou gamma dans le traitement des fractures extra-capsulaires de l’extrémité supérieure du fémur (à l’exception des fractures pathologiques). Résultats et indications à propos d’une série de 135 cas. CHU Sart-Tilman Liège, September 1994. Les Disjonctions Symphysaires et Sacro‑Iliaques et leurs séquelles occasionnées chez le sportif. Sports Surgery Certificate thesis, Pitié‑Salpétrière Hospital, Paris, 1996. Evaluation tomodensitométrique des tunnels après ligamentoplastie au tendon rotulien. Thesis, Liège Medical Faculty1998; supervisor, Pr. R. LEMAIRE. La maladie de Haglund- revue de la littérature, Foot and ankle surgery certificate thesis, Lyon, 2003; supervisor Dr J.-L. BESSE. Le conflit d’intérêt, Le cas d’une Prothèse Totale de Cheville défectueuse. Medical expertise and bodily injury assessment certificate thesis, Joseph Fourier University, Medical Faculty, Grenoble, 2011. Two anti-reflux procedures after Superior Polar Gastrectomy in rats. 27th Congress of the European Society for Surgical Research à Saragossa, Spain, May 23, 1992. L’Ostéochondrite Disséquante de la Rotule chez l’Enfant. Dr J. Magotteaux, Dr J.-L. Grisard. Autumn Meeting of the Belgian Association of Paediatric Orthopaedics, December 5, 1993. Le clou gamma dans le traitement des fractures extra-capsulaires de l’extrémité supérieure du fémur (à l’exception des fractures pathologiques). Résultats et indications à propos d’une série de 135 cas. Sart-Tilman University Hospital, September 1994. Les Disjonctions Symphysaires et Sacro‑Iliaques et leurs séquelles occasionnées chez le sportif. Sports surgery certificate thesis; oral defense, June 19, 1996, Pitié‑Salpêtrière Hospital, Paris. 3-D CT evaluation of tunnels after arthroscopic ACL reconstruction using patella tendon autograft. J.L. GRISARD, S. WILLEMS, J.P. BERGER, G. HOUBEN, First International Congress of the Dutch Society of Arthroscopy and the Belgian Society of Arthroscopy, March 22, 1997, Kaatsheuvel, Netherlands. 3-D CT evaluation of tunnels after arthroscopic ACL reconstruction using patella tendon autograft, J.L. GRISARD, S. WILLEMS, J.P. BERGER, G. HOUBEN. March 17, 1998, Grand Round, Duke University, Raleigh-Durham, North Carolina, U.S.A. Evaluation tomodensitométrique des tunnels après ligamentoplastie au tendon rotulien, J.L. GRISARD, S. WILLEMS, J.P. BERGER, G. HOUBEN, knee surgery presentation, Friday May 22, 1998, annual congress of the French Orthopedics Association (Association des Orthopédistes de Langue Française: A.O.L.F. ), 1998, Louvain-la-Neuve, Belgium. Les tendinopathies achilléennes chroniques: importance d’un diagnostic précis pour une prise en charge adaptée. Annual meeting of the CERNA (Centre de Recherche sur la Neige et les Avalanches) 2000, La Léchère, December 8, 2000. Les tendinopathies d’achille: intérêt d’un diagnostic précis pour une prise en charge adaptée (JL Grisard, S. Abrassart, P. Tellier), CERNA, La Léchère, December 2000. Démarche diagnostique et CAT devant les tendinopathies du pied, CERNA, La Léchère, December 2001. La prise en charge de l’hallux rigidus chez le sportif, Savoy Medicine and Physiotherapy Society (Société Savoyarde de Médecine et Kinésithérapie du Sport), 2005. La Cheville douloureuse chez le sportif. Savoy Medicine and Physiotherapy Society (Société Savoyarde de Médecine et Kinésithérapie du Sport), March 2006. Arthrodèse de la première articulation métatarso-phalangienne par plaque dorsale et vis compressive. Etude prospective de 97 pieds au recul moyen de 9 mois, Dr. Jean-Luc Grisard, Chambéry, Dr. Patrice Diebold, Nancy, Spring Days of the French Foot Surgery Association (Association Française de Chirurgie du Pied: AFCP), Lyon, June 12, 2008. First metatarso-phalangeal joint arthrodesis using cup-shaped reamers and dorsal plate fixation. Prospective study about 97 feet at a nine ms mean FU, J.L. Grisard, MD, Clinique Saint-Joseph, Chambéry, France. Three-yearly congress of the International Federation of Foot and Ankle Societies (IFFAS), Sauipe, Bahia, Brazil, September 12, 2008. L’arthrodèse par plaque dorsale de la première articulation métatarso-phalangienne. Résultats d’une série prospective consécutive de 97 pieds chez 92 patients. J.L. GRISARD, Chambéry, P.F. DIEBOLD, Nancy. Annual meeting of the SOFCOT. First metatarso-phalangeal joint arthrodesis using cup-shaped reamers and dorsal plate fixation. Prospective study about 122 feet at a 18 ms mean FU, J.L. Grisard, MD, Médipôle de Savoie, Private Hospital, Challes-les-Eaux, France. Congresso Nacional do Pé e Tornozelo 2011, Cascais, Portugal. Since September 2015, Lyon Clinique du Parc: recruited by Dr. Coillard and Dr. Boublil, to strengthen their Specialized Foot and Ankle Surgery Unit.